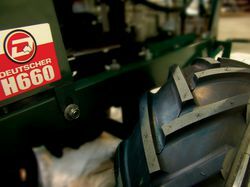 The HE660 Deutscher mower is a world class self-propelled walk behind mower. It has been engineered to give continuous service in the most rugged of conditions, whilst retaining the ability to give a smooth finish to parks and gardens. With lockable front castor wheels and large tractor tread grip tyres on the rear, it allows for use in all types of terrain. 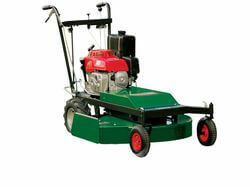 This mower is the regular choice for many council’s, shires, prison farms and mowing contractors throughout the country. 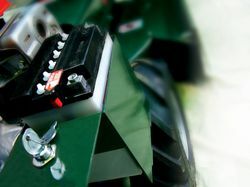 The mowers are exported to a number of countries, including; Papua New Guinea, South Africa, Kenya, New Zealand and other countries where rugged conditions require large, tough self-propelled mowers. 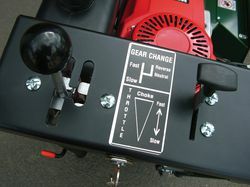 Its design is deliberately rugged for long lasting reliability and safety of use. 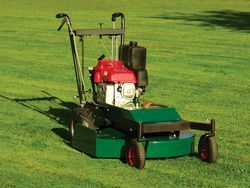 This mower is made from high quality materials and parts. 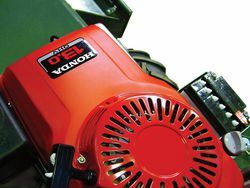 The HE660 is powered by either the Honda GXV340 manual start engine, or a Honda GXV390 electric start.